I'll start off this review with a spoiler: I'm in the market for a new pair of earbuds. It's not what you think though. The Sennheiser CX 680 Earfin Sport Earbuds are not bad, they just didn't last. As I'm double checking the stats on them now, I notice that they do have a 2-year manufacturer's warranty. I should have taken advantage of that when I first had an issue. Oh well, at least I got two years of use out of them. The CX 680 has a nice sporty look with bright yellow Kevlar reinforced cord and in-line volume control. The earfins provide extra security to keep the earbud in your ear while you workout. They are sweat-proof and water-resistant and come with several different sized fins and earbud covers to best fit different sized ears. They also come with a pouch type case for storage. Read on to find out what worked and how they met their demise. I'm one of those people who is very sensitive to microphonics, and if you don't know what that is, you're probably not sensitive to it. Because of this, it took me a long time to find some earbuds that didn't annoy me while running. Instead of earbuds I would run with my iPhone in an armband and listen to music through the phone's speaker. I also bought a Roadnoise vest (review coming soon), so I could attach my phone or iPod and listen through the speakers built into the vest. The CX 680 was the first earbud at an affordable price point that didn't drive me crazy with microphonics. I could finally run with music in my ears and get a waterproof iPod shuffle to use while running instead of taking my phone out in the elements. I believe the reduction in microphonics is due in part to the contact of the earfin bracing the bud against your ear and in part to attaching the volume control clip to your clothing, which cancels out any bumping against the cord on the other side. I was able to remove the segment with the volume control (it's intended to be removable) and still not have significant disturbance. Removing this segment makes the cord about half as long, which, to me, was still a little long for running but much better than the full length. On my first group run with them however, I realized that the earbuds brought along another problem: I couldn't hear anything outside the earbuds. Yep, they have pretty good noise canceling. This makes them great for indoor use, like at the gym, but dangerous for running outside. My solution was to continue running with them, but only use one earbud at a time, freeing up my other ear to hear the outside world. Another problem arose from this practice, however. Using the one earbud method, I would switch which ear I used each time, therefore, switching which earbud was used as well. One day, heading out for my run, I put the earbud in and there's no sound. I check the opposite earbud and everything is normal. While I had used them in rainy conditions with no issues, my guess is that all the moisture from being inside my shirt had killed these "sweat-proof" earbuds. Oh well, I was only using one at a time anyway, so I would just use the working ear every time (the buds are ear specific, meaning the right bud can only fit in the right ear and vice versa). I had been doing this for about a year when the next problem came along: the earbud cover started to come off. When it first happened, I looked around on the ground for it, only to find the yellow cover still in my ear. The cover seemed to have stretched out over time and no longer held securely to the bud itself. It wasn't long before I really did lose the piece and the black fin along with it. I thought I could just try another size, since they came with 3 sizes of each piece, if only I could remember where I put them. The Sennheiser CX 680 Earfin Sport Earbuds provide above average sound quality in an affordable waterproof earbud. The option of a shorter length cord is great, though it could still be a bit shorter. While the earfins aid in reducing microphonics they don't attach securely enough to the earbuds and can easily be lost. Anyone who has an issue with them should remember that they have a 2-year warranty and use it. 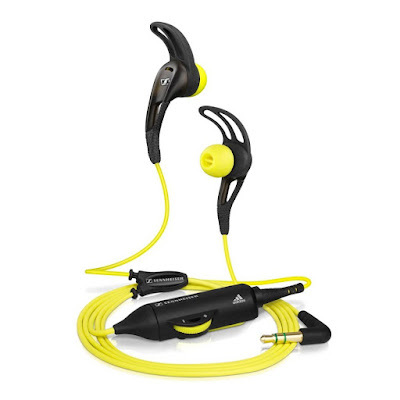 Being that they are noise-canceling earbuds the CX 680 is best suited for indoor use to block out others in the gym. If you listen to music at the gym and while working out outdoors, and don't want to buy two sets of earbuds, you should probably look elsewhere. If you are interested in the CX 680, you can get a certified refurbished pair on Amazon right now for only $19.99. For me, I'm going to go with something more water-proof this time around. Since I'm going to be doing some more swimming in preperation for my first triathlon (eek! ), I'm looking at either Waterfi or Swimbuds for my next pair. Do you listen to music while you run? If so, what's your set up? While this review does contain affiliate links, I have not been compensated in any way to write to it and the opinions are my own. This is where I tell you a little about myself, how my name is Reese, and how I hate writing these little "about me" things. How I majored in English, so I could become a stay at home mom who claims she's going to write a book someday. Babies are stealing my brain cells; that's a good excuse. I like ice cream, running, cycling, and babies. I'd like to do a triathlon someday, but not while eating ice cream and holding a baby. I am not responsible for republished content from this blog on other blogs or websites without our permission. 2014-2015 Audra Reese Derrenberger. Powered by Blogger.